These are gorgeous! LOVING the colors!!!!! Gorgeous cards! Such wonderful clean designs. Love the stenciled background, perfect to ground your floral images. So glad to know W&W has layering guides! These are all beautiful, Tracey! I love seeing how just changing colors can totally change the look of a card--makes it more fun to use the same products over & over! You've been a great Leading Lady--thanks for all the inspiration! Beautiful set of cards! I love the different color variations! Pretty stamp set! stencilled BG. The flowers, all 3 colors, are gorgeous. Very pretty set of cards. Sweet set of cards with this stamp set. Wonderful cards Tracey. I really love the soft inking to add depth in each of the cards. YOu've inspired me to get those stencils back out. It is a great touch. I've enjoyed your stint as leading lady and thanks for all the great tips. oh my stars! i love how the lightly stenciled triangles look 3D! Beautiful cards Tracey. 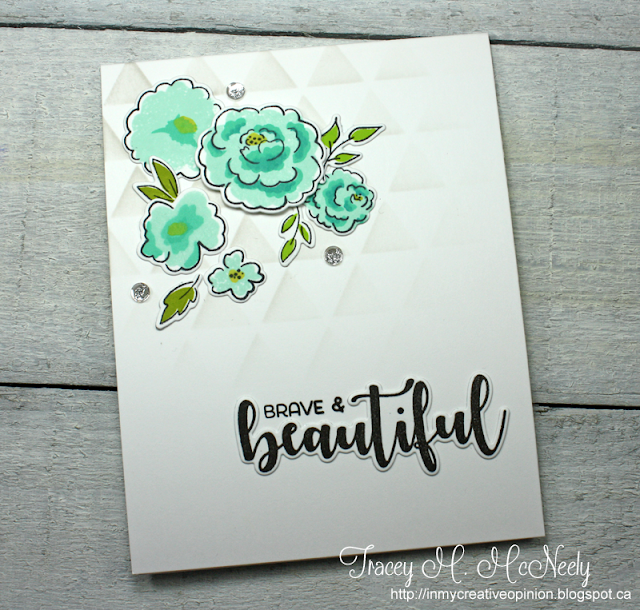 I really love the soft gray stencil behind the gorgeous pops of color. Wow!!! What a lovely set of cards!!! Amazing colouring too!!! I love what the background on the cards-- subtle but adds so much. I like the faded way you sponged the backgrounds, the colors you chose, and the different placement of the flowers. Very pretty cards. You did a great job as the Leading Lady this month! Thanks so much. Tracey, those flower CAS cards are absolutely gorgeous! Pretty set of cards,Tracey! Great colour choices, too. Beautiful cards. 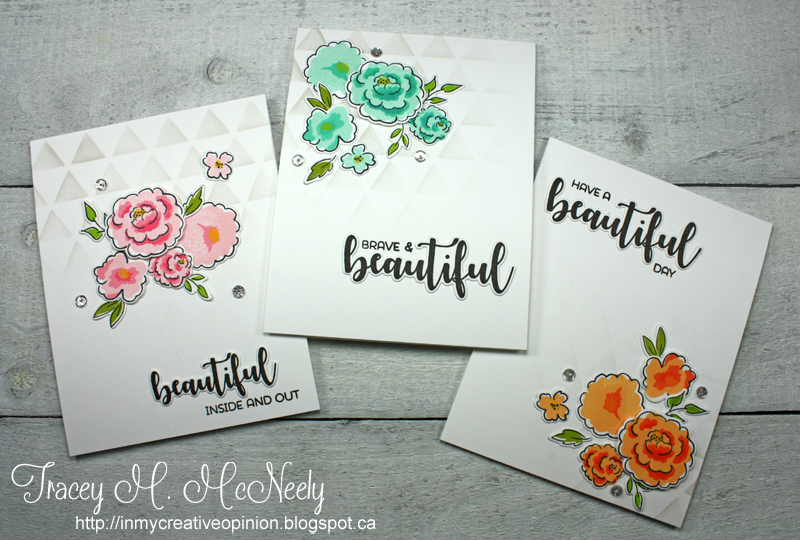 Love the different colors and the stamp set you used. Gorgeous cards, Tracey!! And way to rock your Leading Lady projects, girl!!! You are awesome! 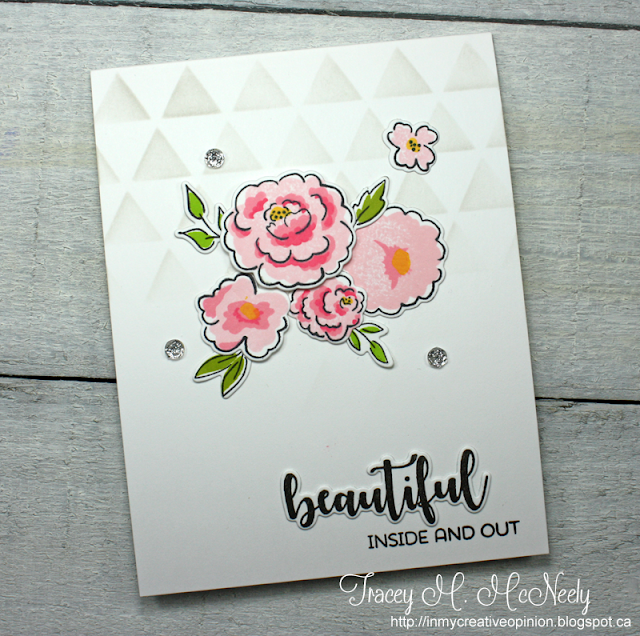 These floral cards are just so sweet and simple, and I love the subtle stenciled background. It lets the flowers take center stage, but adds that little bit of something extra. Thanks for a wonderful month of inspiration!! 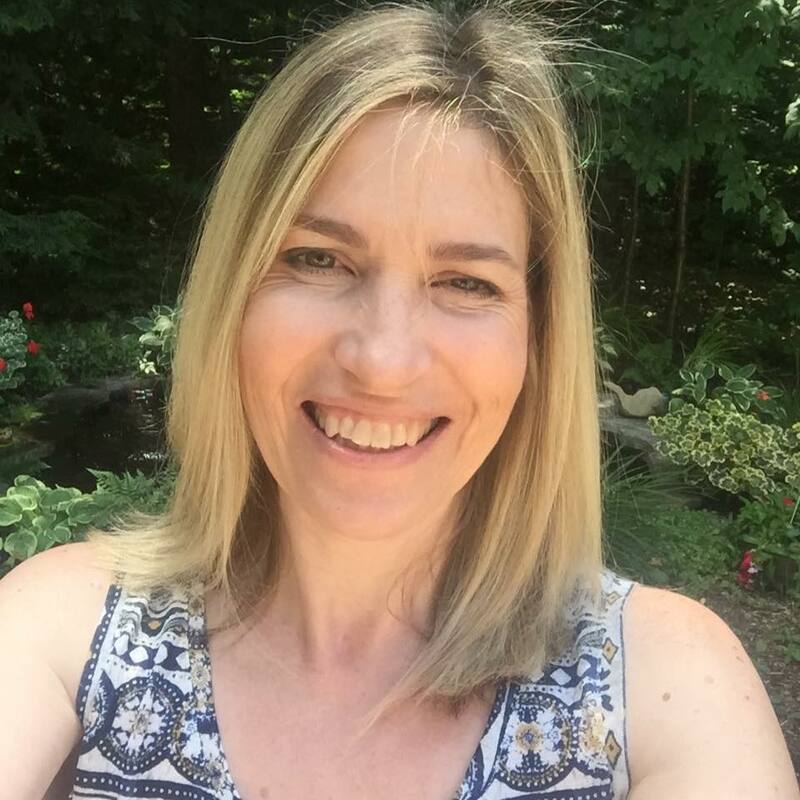 You've done a wonderful job as this month's Leading Lady Tracey! Your finale post is full of exceptionally pretty cards! 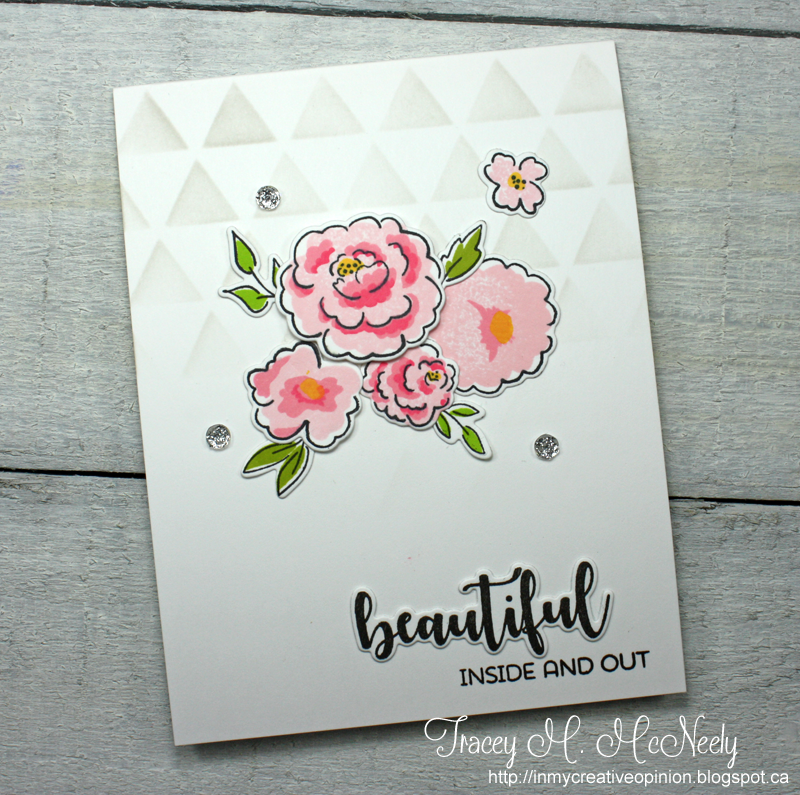 These cards are so pretty and I love how you layered them with the stencil and sequins for a little bit of sparkle. I love those cards in all colors and what a fun idea to add Stickles to the sequins for even more shine. Thank you for an awesome month of inspiration! That little bit of background definitely sets off the focal point! Lovely! The flowers are so sweet, but it's that awesome soft stenciling that makes these cards shine - LOVE it!! I love these very simple, yet elegant cards. The flowers are just lovely and the way they are positioned differently is fabulous. Love these! Wow, what beautiful cards. Thanks for the "how-to". You're the best! The layers of gorgeous colors on the flowers---wonderful! Beautiful cards! I love how you did a gradient for the stencil! 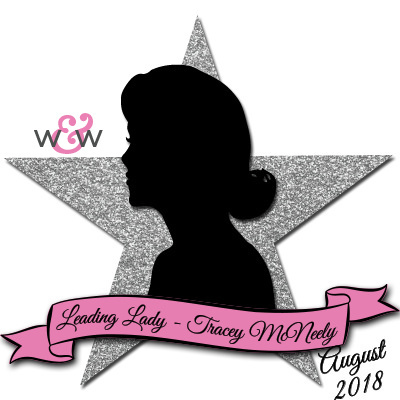 Congrats again on your well-deserved Leading Lady status at W&W, Tracey! 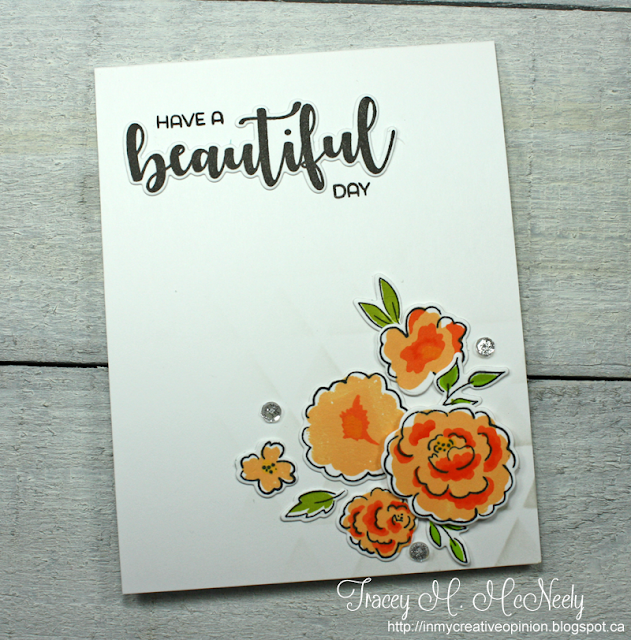 I really love how you played with this stamp and die set...the blooms are so lovely, and your stenciling showcases them perfectly! Love your choice of sentiments, too! I really enjoyed seeing all of your stunning cards during August...so proud of you! Fabulous cards! I love how you layered them with the stencil, So beautiful. Thanks for the inspiration. Love your trio of cards! The stencil behind is so subtle but adds do much to the cards. beautiful! Such pretty cards...love the soft grey in the background.